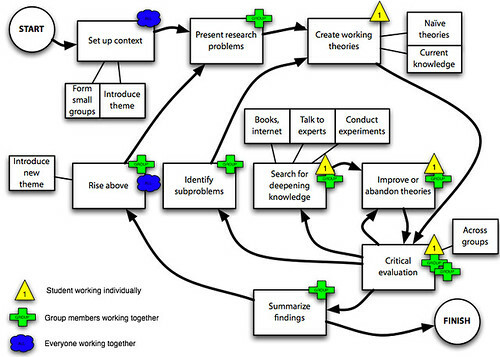 I like this new image from Tarmo Toikkanen describing Progressive Inquiry. The image is actually from 2008, but its new to me. I stumbled across it on flickr. I like the additional detail and how they have learning themes determined by everyone working together. The addition of the icons denoting the participants is useful to know who does what and when. And having the critical evaluation with different next steps makes a lot of sense.